Rapla Coonty (Estonie: Rapla maakond), or Raplamaa, is ane o 15 coonties o Estonie. It is situatit in wastren pairt o the kintra an borders Järva Coonty tae the east, Pärnu Coonty tae the sooth, Lääne Coonty tae the wast, an Harju Coonty tae the north. 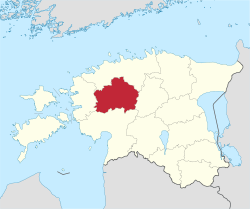 36,678 fowk live in Rapla Coonty – constitutin 2.7% o the total population in Estonie (as o Januar 2009). The first written records o Rapla date back tae the 1241 Dens census (Liber Census Daniae). The Coonty Govrenment (Estonie: Maavalitsus) is led bi a Govrenor (Estonie: maavanem), who is appointit bi the Govrenment o Estonie for a term o five years. Syne 9 August 2004, the Govrenor position is held bi Tõnis Blank. Natural resources foond in Rapla coonty include limestane, dolomite, peat, an clay. The kirk o Rapla wis built in 1901. Housomeivver, hintle o the interior dates back tae several hunder years earlier an is o heich virtu an historical value. In the kirk yard there are several crosses remainin frae the 17t century. This page wis last eeditit on 23 Julie 2013, at 06:10.